Abstract: A temperature variation with a time period of a few decades has been previously reported  and observed in SST data. In this post, a 60 year oscillation with an amplitude of 0.1C is identified in the HadCrut global temperature data and will likely cause a halt in global warming over the next decade or so. An astronomical origin is proposed as a possible cause of this effect. No single astronomical effect can explain the 60 year time period, so the possibility of an interference between the 11 year variation in solar irradiance with magnitude 0.05C and an 18.6 year 0.05C ocean tidal component due to precession of the moon’s orbit plane has been investigated. 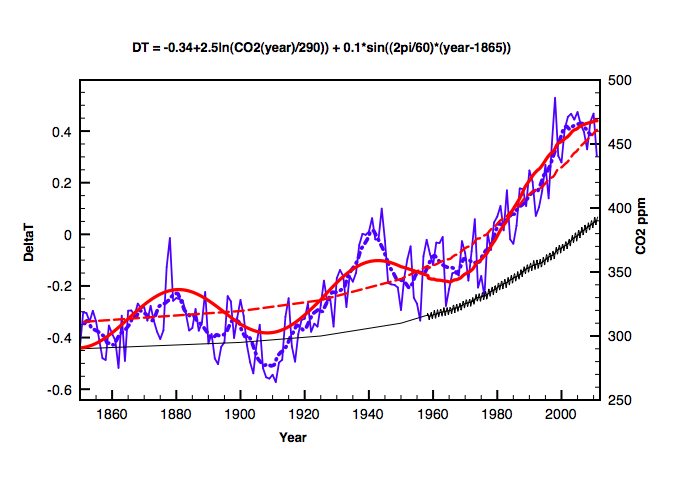 However, there is no convincing evidence that this can drive the 60 year 0.1C temperature oscillation either. Introduction: The long term trend in global average temperature data  fits rather well to a simple logarithmic dependence on CO2 concentrations. A simple model based on incremental surface warming to the radiative forcing of CO2 in order to restore overall energy balance, predicts a dependence deltaT = 1.6Ln(C/C0), where C is the CO2 concentration in any given year and C0 is a reference concentration in a given year to which deltaT is measured. However a better overall fit to 160 years of data  is given by deltaT = 2.5Ln(C/C0). This simple model has been criticised because it assumes that the Earth’s surface responds within a one year period to an increment in radiative forcing. For land surfaces this is certainly the case, whereas for oceans the response time is likely longer. This simple model for the CO2 greenhouse effect predicts about 2/3 of the observed warming (1.6). The remaining 1/3 may simply be due to other increases in greenhouse gases (CH4, CFCs) as summarised in the 2007 IPCC report (1.6+ 0.9 = 2.5) . Others may disagree with this interpretation. 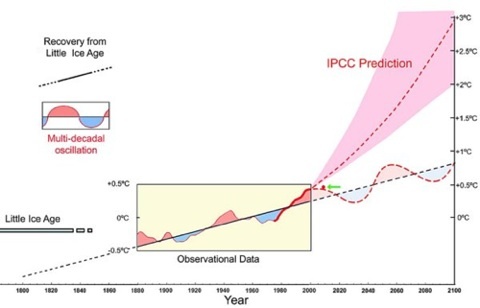 The objective of this post, however, is not to argue one way or the other on this, but rather to concentrate on the regular multi-decadal variation that is clearly apparent in the data over and above any long term trends. This regular oscillation is clearly evident below. DeltaT(year) = -0.34 + 2.5ln(CO2(year)/290) + 0.1sin(0.105*(year-1860)) – equation 1. By comparing differences in independent measurements of deltaT between ground and satellite – HadCrut and UAH since 1979 one can get an estimate of the errors for a single yearly value. This error is about 0.1C. Using this error estimate we can then compare just how well the calculated red curve fits the 160 year HadCrut series by calculating Chi**2 of equation 1. to the data. When this is done we get a total Chi-squared value of 165 for 157 degrees of freedom (or Chisquared/Ndf approx= 1.0) showing that the curve is rather a good fir with a high confidence level. This also strongly supports the view that the oscillation is a real effect. Several others have previously proposed and discussed the existence of a multi-decadel variation in temperature [see discussion ref 1]. Many argue that the oceans must be the vehicle of such a long term temperature effect since they alone have the required heat capacity. However the primary cause for such a variation in ocean temperature is uncertain. It is natural to look for an astronomical origin of this effect as it seems to be global rather than say restricted to just one region. Only the Sun and the Moon are likely to have sufficient direct effect on Earth to be possible causes, but neither display any obvious 60 year cycle. 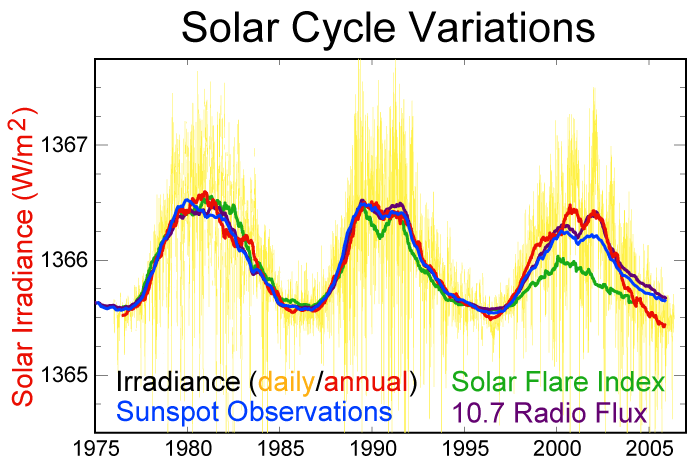 The 11 year cycle of sunspot activity causes a small but periodic variation in solar radiance on the Earth’s surface. The magnitude of this variation is about 0.1% of the radiant energy on the Earth’s surface or a variable forcing of about 0.2 watts/m2. One can estimate that such an effect has capacity to vary surface temperatures by around 0.2 degrees C with an 11 year cycle. The moon produces diurnal tides in the world’s oceans and strong tidal currents near continents. The orbit plane of the moon precesses between +5 and -5 degrees to the ecliptic plane with a time period of 18.6 years. The angle of the orbit plane to the Earth’s equator varies from 28 to 18 degrees and this changes the latitude of the maximum tidal bulge on an 18.6 year cycle. It seems reasonable to assume that this varies the ocean driven transfer of heat across the Earth . Once more the expected periodicity is18.6 years and not the observed 60 year cycle. The magnitude of this effect is difficult to estimate. However let’s assume that it is capable of producing a 0.05 degree C global oscillation . We can then investigate what the combined effect of both the solar variability and the tidal variability would be. To investigate this possibility I have taken a linear superposition of two periodic oscillations coinciding with the actual minima and maxima observed years from the two graphs above. Both effects interfering with each other with the independently observed phase differences produce an interference curve but not a simple periodic variation of 60 days as observed. The presence of this oscillation in the data can explain the apparent rapid increase in temperatures observed in the 1980s and 1990s. Since 2000 no significant increase in temperatures has been observed and a further 20 years of flat or decreasing temperatures can be expected. The enhanced greenhouse effect due to increasing CO2 levels is still present and a further increase can be expected from 2030 for a further 30 years. 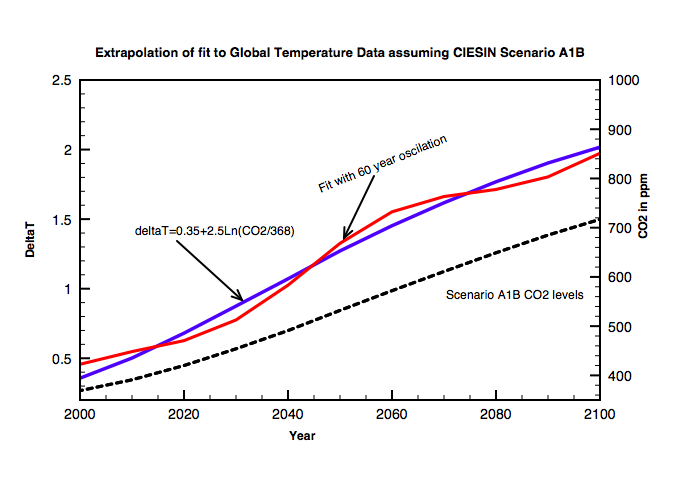 Taking the emission scenario A1B, (which is consistent with current rises), from the IPCC/CIESIN reports, and applying the fitted data as described above to CO2 levels, predicts a temperature increase below 2C by 2100 but with periods of enhanced increase followed by flat periods, each of about 30 years. 90 years is a very long time both in technological and economic terms, so CO2 emissions are likely to be reduced anyway below the A1B scenario envisaged. As stated before I am not an expert on climate science and perhaps more complex feedback effects are also present. However the data itself show no evidence to date of any additional feedbacks once this natural 6 decade oscillation is folded in to a logarithmic temperature rise from an enhanced greenhouse effect. Only modest temperature rises are predicted in this case during this century. 2. The rapid rise in temperatures observed during the 1980s and 1990s is probably caused by this oscillation superimposed on an underlying greenhouse warming. From 2000 to 2010 temperatures have remained static and no further increase is expected for another 10 years despite an expected increase in CO2 levels. 3. There is no single astronomical effect which can explain the 60 year time period. 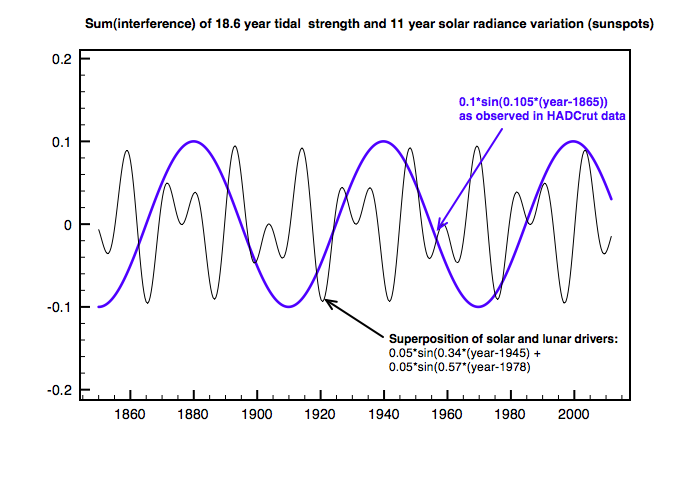 I have looked into the possibility that a superposition of both the 11 year solar variability and the 18.6 year lunar tide could produce the observed 60 year oscillation. There is no convincing evidence that this is the case. One thought was that the period was somewhere between 60 and 66 years depending on whether or not the AMO and PDO are in phase. For the peak near 1940, they were in phase. They are slowly going out of phase as the AMO is something like 5 years shorter. One thing that I wondered about as soon as I saw that 66 year period was whether or not the 22 year polar flip solar cycle had anything to do with it as it was one third the cycle length, but it just seems to be a coincidence. Last week, I happened across a graph I had not seen in a few years, but I did not bookmark it. It shows the temperature trend with the ocean variation removed. It was similar but better than the modicum of work I did on this subject. If I find it again, I will let you know. This graph is similar to your first graph above, except it projects to 2100, and I think it goes back farther, perhaps using a proxy. Its also different because it uses a more linear trend than your red dashed curve. It seems to me that the ends of your red dashed curve are both too high — the slope at the beginning is too shallow, and the slope at the end is too steep. Of course, another 60 or 120 years of data would correct that, but it seems no one wants to wait another 60 years. Yes – this graph is prophetic. When I started looking into all this stuff I remember reading his paper, thinking that being based in Alaska he would know whether hype about the retreating arctic ice cover was fact or spin. Ran across your site because I am trying to understand where this 60 year cycle thing originates. The earliest reference I can find to it is some old book “the Jupiter effect” and lots of pseudo-science quacks who want to connect a gravity force diectly from Jupiter to Earth with two body Newtonian calculations I assume to link in. I actually can’t find a scienctific or astronomical reason for a 60 years cycle to exist do you know the source of this belief? Reply uglybb: I don’t really undertsand the 60 year oscillation although it seems to be linked to the “Pacific Decadel Oscillation (PDO) and the Atlantic Multidecadal Oscillation (AMO). The origins of these is not really explained either. There is a paper here: Nicola Scafetta, Empirical Evidence for a celestial origin of the cimate oscillations and its implications. http://arxiv.org/pdf/1005.4639 which does seemingly link the oscillation to the orbit of jupiter. In the next post A Fit to Global Temperature Data I find that a fourier analysis shows there are 11 year, 9.3 year and 60 year terms present in the data. Hello Clive, interesting article, any chance you could update it with current data?